Michael Ellis DeBakey (September 7, 1908  July 11, 2008) was a Lebanese-American cardiac surgeon , scientist, and medical educator. DeBakey was the chancellor emeritus of Baylor College of Medicine in Houston, Texas, director of The Methodist DeBakey Heart & Vascular Center, and senior attending surgeon of The Methodist Hospital in Houston. He worked on the treatment of heart patients, and played a role in the development of the mobile army surgical hospital. DeBakey received his BS degree from Tulane University in New Orleans. In 1932, he received an M.D. degree from Tulane University School of Medicine. He remained in New Orleans to complete his internship and residency in surgery at Charity Hospital. DeBakey completed his surgical fellowships at the University of Strasbourg, France, under Professor René Leriche, and at the University of Heidelberg, Germany, under Professor Martin Kirschner. Returning to Tulane Medical School, he served on the surgical faculty from 1937 to 1948. From 1942 to 1946, he was on military leave as a member of the Surgical Consultants’ Division in the Office of the Surgeon General of the Army, and in 1945 he became its Director and received the Legion of Merit. DeBakey helped develop the Mobile Army Surgical Hospital (MASH) units and later helped establish the Veteran’s Administration Medical Center Research System. He joined the faculty of Baylor University College of Medicine (now known as the Baylor College of Medicine) in 1948, serving as Chairman of the Department of Surgery until 1993. DeBakey was president of the college from 1969 to 1979, served as Chancellor from 1979 to January 1996; he was then named Chancellor Emeritus. He was also Olga Keith Wiess and Distinguished Service Professor in the Michael E. DeBakey Department of Surgery at Baylor College of Medicine and Director of the DeBakey Heart Center for research and public education at Baylor College of Medicine and The Methodist Hospital. DeBakey’s ability to bring his professional knowledge to bear on public policy earned him a reputation as a medical statesman. He was a member of the medical advisory committee of the Hoover Commission and was chairman of the President’s Commission on Heart Disease, Cancer and Stroke during the Johnson Administration. He worked in numerous capacities to improve national and international standards of health care. Among his numerous consultative appointments was a three-year membership on the National Advisory Heart and Lung Council of the National Institutes of Health. At age 23, while still in medical school at Tulane University, DeBakey developed the roller pump, the significance of which was not realized until 20 years later when it became an essential component of the heartlung machine. The pump provided a continuous flow of blood during operations. This, in turn, made open-heart surgery possible. With his mentor, Alton Ochsner, he postulated in 1939 a strong link between smoking and carcinoma of the lung. DeBakey was one of the first to perform coronary artery bypass surgery, and in 1953 he performed the first successful carotid endarterectomy. 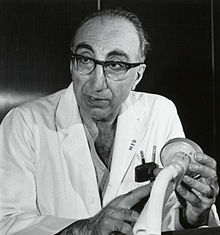 A pioneer in the development of an artificial heart, DeBakey was the first to use an external heart pump successfully in a patient  a left ventricular bypass pump. In the 1960s, DeBakey and his team of surgeons were among the first to record surgeries on film. A camera operator would lie prone atop a surgical film stand made to DeBakey’s specifications and record a surgeon’s eye view of the operating area. The camera and lights were positioned within three to four feet of the operative field, yet did not interfere with the surgical team. DeBakey hired surgeon Denton Cooley to Baylor College of Medicine in 1951. They collaborated and frequently worked together until Cooley’s resignation from his faculty position at the college in 1969. DeBakey initially resisted the surgical option, but as his health deteriorated and DeBakey became unresponsive, the surgical team opted to proceed with surgical intervention. In a controversial decision, Houston Methodist Hospital Ethics Committee approved the operation; on February 910, he became the oldest patient ever to undergo the surgery for which he was responsible. The operation lasted seven hours. After a complicated post-operative course that required eight months in the hospital at a cost of over one million dollars, DeBakey was released in September 2006 and returned to good health. Although DeBakey had previously refused surgery, he later stated that he was grateful that his surgical team performed the operation. On July 11, 2008, DeBakey died at The Methodist Hospital in Houston, two months before his 100th birthday; the cause of death remained unspecified. DeBakey was preceded in death by his first wife, Diana Cooper DeBakey who died of a heart attack in 1972 and by his sons, Houston lawyer Ernest O. DeBakey, who died in 2004, and Barry E. DeBakey, who died in 2007. His brother Ernest, a general surgeon in Mobile, Alabama, died in 2006. In addition to his wife, Katrin, and their daughter, Olga, DeBakey was survived by sons Michael and Denis, as well as sisters Lois and Selma DeBakey, who are both medical editors and linguists at Baylor. After lying in repose in Houston’s City Hall, being the first ever to do so, DeBakey received a memorial service at the Co-Cathedral of the Sacred Heart on July 16, 2008 Dr. DeBakey was granted ground burial in Arlington National Cemetery by the Secretary of the Army. On January 21, 2009, DeBakey became the first posthumous recipient of The Denton A. Cooley Leadership Award. In honor of DeBakey, the DeBakey Medical Foundation, in conjunction with Baylor College of Medicine, annually selects recipients of the Michael E. DeBakey, M.D., Excellence in Research Awards. The awards recognize faculty who have published outstanding scientific research contributions to clinical or basic biomedical research. The awards are funded by the DeBakey Medical Foundation and have funded researchers from the Center for Cell and Gene Therapy at Texas Children’s Cancer Center. The Foundation helped to establish the Michael E. DeBakey, Selma DeBakey and Lois DeBakey Endowed Scholarship Fund in Medical Humanities at Baylor University. The scholarship designates award recipients as “DeBakey Scholars” in recognition of the legacy of the DeBakey family.